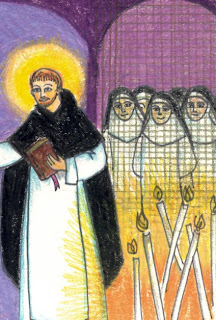 CELEBRATING OUR HOLY FATHER SAINT DOMINIC! A Blessed & Joyous Feast of our Holy Father St. Dominic to all our Brothers and Sisters throughout the world and to all our dear friends and readers as we thank God for giving us and the Church this "evangelical man" who we call "Light of the Church", "Preacher of Truth", "Rose of Patience" and "Ivory of Chastity". May we trust in his promise to be more faithful to us after death than during life and truly be other "Dominic's," faithful to our vocation of preaching for the salvation of souls, whether that be in the pulpit, in the classroom, on the street, or in the silent and hidden sanctuary of the cloister. As we nuns celebrate the 800th year of our founding, we thank God for the wonderful gift of our vocation and the gift of such a father! Bl. Jordan says that the first nuns had "no other master and father" and 800 years later we continue to feel his fatherly love for his first-born daughters! Below is the text of the little we have of the writings of St. Dominic. Besides this letter we know that he wrote some parts of the Primitive Constitutions. A framed copy of this letter, a gift of our monastery in Newark, NJ, hangs outside of our Choir.